POTENTIAL Port Adelaide father-son selection Taj Schofield has been picked in the Australian under-17 side to face the New Zealand Hawks later this month. Schofield is the son of Port Adelaide premiership player Jarrod Schofield who is currently the Power’s midfield coach. The 16-year-old is a 2020 draft prospect but has already shown promise, having been named in the Under 16 All-Australian side last year after averaging 17 disposals for Western Australia during the national carnival. He played in a colts premiership with Subiaco in 2018 but moved back to Adelaide this year with his family and joined Woodville-West Torrens and the Henley High School football program. His father Jarrod played 160 games for Port Adelaide, including being part of the historic 2004 Premiership side, as part of a 206 game AFL career which started at West Coast and ended at Fremantle. Possible Adelaide father-son selection Luke Edwards is also in the Australian squad. The son of two-time premiership player Tyson saw his brother Jackson spend a year on the Crows’ rookie list in 2018 before being delisted without managing an AFL debut. The Australian side will go into camp in Melbourne on April 24 under coach Luke Power before facing New Zealand as part of a curtain-raiser at Marvel Stadium to the clash involving St Kilda and Adelaide. In previous years the game has been played in New Zealand, but after changes to this year's under-18 system and Academy structure, it has been shifted to Melbourne. 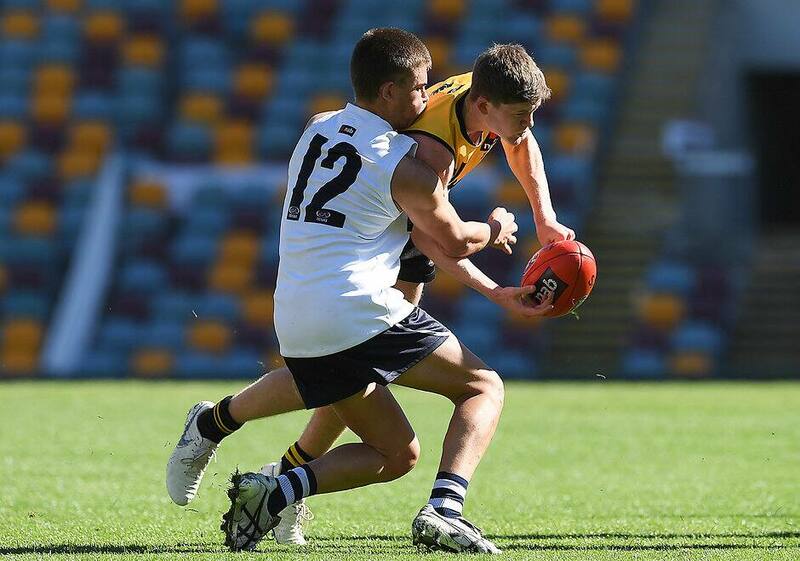 Elijah Hollands, the son of former Richmond player Ben, has already shown recruiters he looms as an early selection next year, as has Jamarra Ugle-Hayden, an agile and versatile forward. Another familiar name in the group is Oliver Henry, the younger brother of Geelong defender Jack. Talented pair Tanner Bruhn and Kaine Baldwin have been selected but will not play in the game due to respective knee injuries.